Dawn comet PanSTARRS (C/2015 ER61) just underwent a bright outburst and is now an easy binocular object. Take a look before the Moon returns! 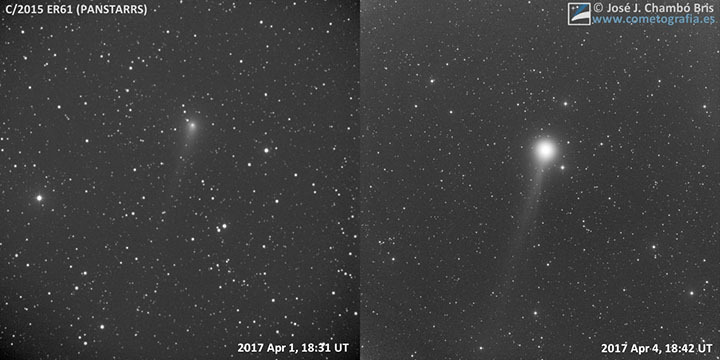 Look at the difference in appearance of comet PanSTARRS (C/2015 ER61) pre-outburst (left) on April 1st and in outburst on April 4th. 2017 may well go down as the year of the binocular comet. Three have been easy catches, and it's only the start of April: 45P/Honda-Mrkos-Pajdusakova, 41P/Tuttle-Giacobini-Kresak and Lovejoy (C/2017 E4). Now there's a fourth. Overnight, PanSTARRS (C/2015 ER61) joined the club. Discovered two years ago on March 15th by the Pan-STARRS 1 telescope on the summit of Haleakalā, it was a faint 21st-magnitude midge. But how it's bloomed! By late March and the start of April, the comet had brightened to around magnitude +8.5 while puttering across Sagittarius and Capricornus low in the southern sky before dawn. This April 5th photo catches the comet in the full glory of its outburst. Then it happened. On April 4th, comet observer Juan José González Suárez reported a possible outburst to magnitude +7.4. This was confirmed, both visually and photographically, by several observers including myself early this morning. It's now as bright as magnitude +6.5, a leap of two magnitudes practically overnight! Although the specific cause of the outburst isn't known, it's likely that some sort of outgassing or disruption on the comet's surface exposed fresh ice to sunlight, initiating a new wave of vaporization. Even from northern Minnesota, where the PanSTARRS only managed to climb to 7° at dawn's approach, I caught it in my trusty 10×50 binoculars crossing the border from Capricornus into western Aquarius. Comet PanSTARRS (C/2015 ER61) tracks close to the ecliptic in Aquarius in the coming weeks. The map shows daily ticks (5 a.m. CDT) and is marked at 3-day intervals. Stars are plotted to magnitude +7.5. The view faces east and shows the sky at the start of dawn from mid-northern latitudes (40° N, specifically). 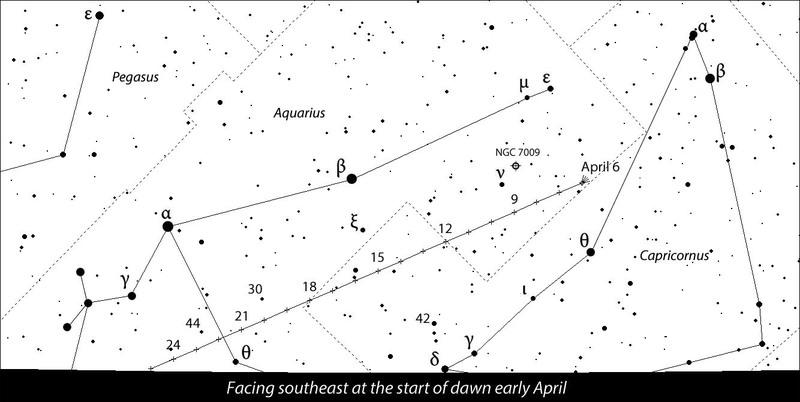 Although the comet appears to be moving downward and out of view, it's only because the map date is April 6th. In reality, the downward movement will be compensated by the westward, rising movement of the stars with the comet maintaining a roughly constant altitude of ~10° at dawn. As twilight swelled, the comet rose higher and became unmistakable. Due to its low altitude, I wouldn't say it was bright, just a soft, round fuzzball easy to pick out from the barren star field. Through a 10-inch telescope at 60×, I estimated the moderately condensed coma at 8′ in diameter with a degree of condensation (DC) of 5. A faint, broad tail extended about ½° to the west-southwest. A splendid sight! 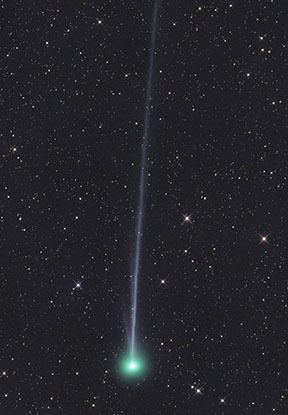 Comet E4 Lovejoy with its bright, narrow gas tail on April 3. The comet shines at magnitude +6.5 and is still brightening. Compared to comet Lovejoy (C/2017 E4) located further north and east in Pegasus, PanSTARRS has a big coma — nearly twice as large but neither as dense nor as bright. 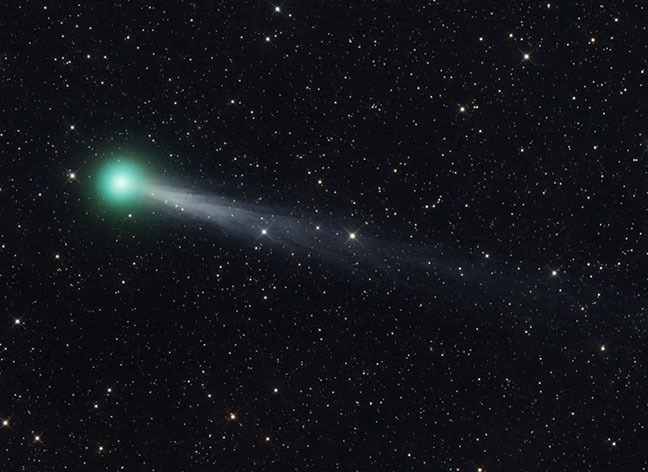 Lovejoy was much more compressed (DC=7) and distinctly blue-green with a short, faint tail about 15′ poking out to the west as seen through the 10-inch. With binoculars I compared Lovejoy to the nearby globular cluster M15; to my eyes they appeared nearly identical in size and brightness, which would put the comet at about magnitude +6.5. These are wonderful times for comet watchers even if you have to get up at 4:30 in the morning to see these ever-alluring puffballs. Speaking of which, there are few moonless left for pre-dawn comet catching. The waxing gibbous returns on April 7th or 8th and will do its best to thwart the view. But given that both Lovejoy and PanSTARRS are reasonably bright and compact, we might still get good looks while waiting for the Moon to slim down. Comet PanSTARRS passes closest to Earth on April 19th at a distance of 109.5 million miles. It's expected to continue to brighten on its way to a May 10th perihelion. How the outburst may affect its light curveis anyone's guess!